Musician and Sarasota Dentistry client, Brad Williams has a unique story about how Invisalign saved his career and gave him a new lease on life. 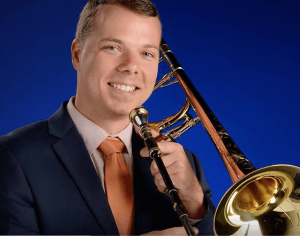 Brad has been performing Trombone professionally for 15 years, and about 6 years ago began having problems with numbness in his lip. He was experiencing a lot of unpleasant tension while playing, which led to a tear in his lip and a moment of no feeling in half of his upper lip. He was becoming increasingly concerned. After investigating the problems caused by playing the Trombone, he realized that his teeth were twisted from playing the instrument. Brad has been playing Trombone since he was 6 years old; it is his life and his livelihood, and he was scared he would not be able to play anymore. When the pain became more of a focus than the music, he decided to seek treatment. Brad knew braces weren’t going to be an option because he wouldn’t be able play the instrument with braces on. Brad spoke with several dentists about his problem and was “more or less blown off.” He didn’t feel like his concerns were being heard…until he met Dr. Michael. After meeting with Dr. Michael over dinner and discussing Brad’s presenting problems, Dr. Michael suggested Invisalign. From there the two started working closely together to fix Brad’s teeth. Dr. Michael had Brad’s back throughout the entire process. He was there every step of the way, during a very scary part of Brad’s life. About half way through the process Brad already felt a difference in his lip. When he felt the shift, he knew he would be able to continue to play the Trombone and pursue the love of his life! Watch Brad’s video testimonial about his experience and his Invisalign process.